British Muslim teacher denied entry to US on school trip: Juhel Miah from south Wales was removed from plane in Reykjavik despite suspension of president’s travel ban … A council spokesman said Miah was left feeling belittled at what it described as “an unjustified act of discrimination”. The council said the teacher is a British citizen and does not have dual nationality. These stories are becoming so commonplace that I don’t even bat an eye at them anymore. And that is how it starts, through normalization. More specifically, banality, the banality of evil, as Hannah Arendt wrote. Long before [[REDACTED]] became the president-elect, his detractors warned against “normalizing” his myriad violations of campaign decorum: the bigotry and misogyny, the Putin-philia and cavalier talk about nuclear weapons. Since [his] election …, “don’t normalize this” has become a liberal mantra, a reminder to stay vigilant in the face of aberrant presidential behavior that Americans may feel tempted — or emotionally bludgeoned — into excusing as just the way the country works now. Four things, related in complex ways. One, the (very common) deflection of physical symptoms to psychological states (“You have knots in your lower back” > “You have lots of anxiety in your lower back”), here carried to an absurd degree of specificity, with knots or musculuar tension being attributed to homophobia. Two, the physical intimacy of massage, here between two men. Three, the formal composition of the drawing, with the masseur at right angles to his client and all those vertcal lines, broken by the angled branch on the scroll, which connects the bodies of the two men. Four, the word homophobia, to which some have objected, on the grounds that it’s contrary to etymology: –phobia from the Greek ‘fear’ root, but homophobes, it is claimed, are not so much fearful of homosexuality as averse to it. Such words often come with associations to existing words, or parts of words, in the language, and sometimes there are official origin stories that invoke these associations, though the official stories often just scratch the surface of the full set of associations. Annals of lexical confusions and innovations. Two word problems from Ruthie in the cartoon One Big Happy (two recent strips), a word confusion and two innovations from the tv show Psych. Chicks dig the sternum bush. Translation from the very playful ShawnSpeak: ‘Women like chest hair’. That is, unbutton your shirt and show some chest hair. Standard sternum ‘chest, breastbone’ plus bush ‘luxuriant growth of hair’, especially in vulgar slang bush ‘a woman’s public hair’. It’s a bit late to the party. X-mentum has been floating around for at least 6 years, much of it sarcastic (mitt-mentum four years ago). Well, I never said it was new; I said it was new to me. But then I’m very much not a fan of inside discussions of political campaigns. That is, the -mentum libfix (which has not been reported in this blog) comes from a world I don’t know a lot about, but it turned up in more general reporting, so it was notable to me. I was ignorant of the libfix. The question is whether I should have known about it; if so, then I should at least have apologized for my ignorance, and possibly I should now go back and delete the posting as of no significance to anyone but me. (1) Substance abuse, easily one of the most widespread mental health problems in this country, has yet to be adequately addressed by the current health care system. Rehab services are far and few between for patients who are addicted to drugs and alcohol. Formally, this looks like what’s known in the speech errors business as a word reversal (Vicky Fromkin’s preferred term), word exchange (my preferred term), word metathesis, or (more colorfully) word-level spoonerism: the conventional form of the boldfaced expression is few and far between. There’s no question that such reversals or exchanges do occur as inadvertent speech errors, but there are reasons for thinking that (1) is not in fact an inadvertent error, but is more like a classical malapropism, in which the speaker or hearer produces exactly what they intended, but their production doesn’t accord with the practices of the larger community. And there’s a third possibility: that the practices of the larger community have changed to such an extent that it can no longer be claimed that (1) is clearly not in accord with them. 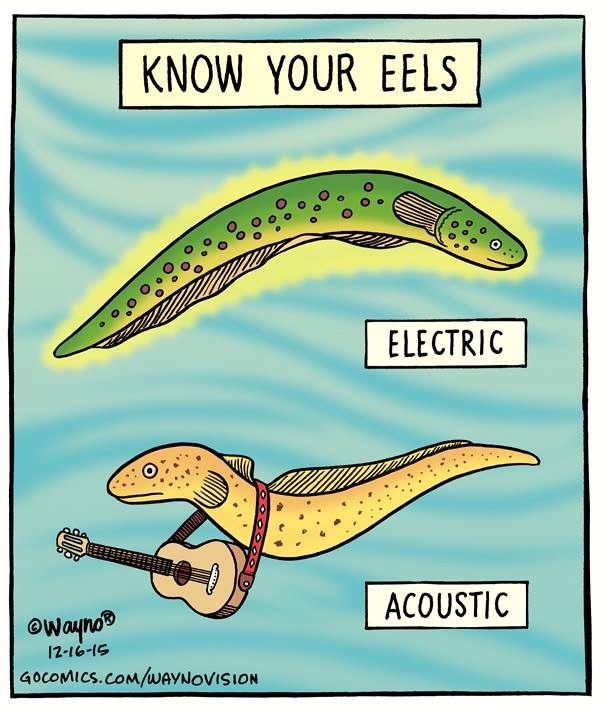 and X is acoustic eel. Two things came together. One, in response to a query from a reader, I’ve been struggling to compile some sort of list of my terminological innovations, only to discover that a fair number of these seem to have been invented independently by others. Two, a friend wrote (to me, as a card-carrying linguist) to ask for credit for her invention of thirstrated, a portmanteau of thirsty and frustrated (parallel to hangry, a portmanteau of hungry and angry) — only to be disappointed when I told her that Urban Dictionary already had an entry for thirstrated in this sense, though I reassured her that independent innovations happen all the time. You are currently browsing the archives for the Innovations category.